For several years FRAMATOME has developed ultrasonic phased array probes for the inspection of tubes from the inside and from the outside, these developments were made necessary for applications where the geometry of the tubes or speed inspection were such constraining that classical technics: mechanical rotating probes, were not applicable. In such cases ultrasonic phased array probes offered one good solution. In this paper we will present different applications of this technique, with the different associated probes concepts. The principles of Electronic Beam Focusing and Skewing is described in a simple manner from Figure 1. The transducer, so called phased array, is composed of a set of N piezo-electric independent element which are each excitated by an independent electric impulse. Choosing a sub-set of elements and applying an electric excitation of each element with an appropriate time delay, the resulting acoustic field generated by the subset of element focused on a point. The delay time is simply calculated so that each elementary acoustic waves propagating from each element arrive together in phasis at the desirated focal point. It's easy to see on Figure 1A, that the time delay law is symmetric for the focusing. Following the same principles, phased array transducers may be used to do beam skewing. Figure 1B shows this case where the time delay law is a simple straight line calculated to skew the beam at the desired incident angle. Superposing the two previous time delay laws, the Beam is Focusing and Skewing, see Figure 1 C.
Now using a large number of elements, much greater than the number of element of the sub-set used to synthesize the beam, it's possible to electronically sweep this beam at high speed. Figure 1 shows a 1D (one dimension) phased array. For this simple case beam focusing and skewing may be obtained in only one plane, called the incident plane (i.e the plane perpendicular to the surface of the transducer). For this simple 1 D array focusing in the plane perpendicular to the incident one may be obtained by mechanically shaping the surface of the transducer. However great care is required to conceive such transducers mainly to take account of secondary lobes (grating lobes) inherent of phased array and so powerful modelization software are necessary for the conception of probes. Great care has also to be brought to the realization of the transducers, for example to obtain homogeneous elements (sensitivity, frequency, directivity...). The use of piezocomposite transducers allow, now, to reach these objectives. Finally the electronic equipment have also to reach high performances to be able to drive such transducers. Using these concepts, Electronic Focusing, Skewing and Sweeping of the ultrasonic beam, we have developed several circular phased array probes for the inspection of tubes ,either by the inside of it, or by the outside of it. Such probes and their performances are described below. These probes have been developed for the in service inspection of steam generator tubes. At present these tubes are mainly inspected by Eddy Current for the detection of cracks, ultrasonic inspection are not used in a great extent for different reasons although it's offer a greater capacity for sizing defects. One reason is that conventional technique using mechanical rotating probes is rather slow respect to the surface multiplied by the number of tubes to investigate. In fact the rotational speed of such probes is limited to a few rounds per second. The phased array probes we have developed allow to reach rotational speed of the ultrasonic beam greater than 200 rounds per second with the same efficiency of detection and sizing of defeats. In fact, for this application, the speed limits are often given by acoustic: time of flight of echoes, and acquisition systems. On Figures 2 we show two examples of probes we have developed. The conical shape probe ~) of Figure 2A has been developed for the detection and sizing of circumferential cracks, fatigue cracks and stress corrosion cracks (SCC). The shape of phased array transducer has been conceived to generate a 45° shear wave beam in the thickness of the tube, the outer diameter of the probe is about 10 mm and the total number of elements is up to 128, the peak frequency of the emitting wave is 10 MHz with a band pass of about 80 percent allowing a good tune resolution. The cylindrical probe of Figure 2 B has been developed for 0° longitudinal wave inspection: profilometry, wearness and wastage like defect detection. This probe present the same characteristics of the first one excepted the shape which has been designed for 0° inspection and focusing of the beam in the incident plane; note that the beam focusing in the other plane is applied by the electronics. Using phased array technology it's then possible to solve the problem of acquisition rate, beyond this advantage such probes allow to push away the application area limits, in fact the need for only one mechanical motion axis allow such probes to inspect tubes with very constraining geometry, such as small curvature tubes. Manufacture of tubes for some industries (nuclear, chemical aeronautic, ...) require a 100 % inspection of their tubes due to severe conditions use and safety. Generally this inspection is performed by ultrasonics for it applies to both examination of inner and outer surface of the tube and outer diameter and thickness measurement. So due to the total surface of tube to and the great number (a few thousand a day in some cases) of tubes to inspect per day, high speed inspection system are necessary. On Figure 3 we summarize the usual examination of a tube, two probes are required for the detection of axial defects, two other probes are required for the detection of circumferential defects and one or two probes for the outer diameter and thickness measurement. The phased array transducer had to be versatile in order to be able to detect either axial or circumferential defects and to be used for different diameters of tubes. The recurrent cost of manufacturing of such probes had to be low, adapted to these industries. 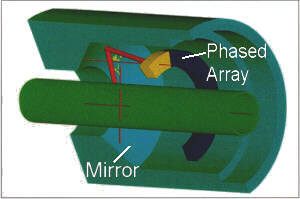 The probe is described on Figure 4, an annular phased array transducer is associated with a 3D axisymetric mirror used to reflect, deflect and focus the ultrasonic beam in the tube. For the detection of axial defect an electronic delay law is applied on one sub-set of element to deflect the beam out of the axis of the tube, this delay law take also account the electronic beam focusing in the plane perpendicular of the incident plane. The mirror reflect the beam normal to the surface and focus it in the incident plane. For detection of circumferential defect or 0° inspection the same principles are applied but without electronic deflection of the beam, the mirror is just calculated to obtain the desired incident focused beam. Figure 5 show an example of A-Scan obtained on a 50 µm depth, 1.5 mm length axial notch on the outer diameter of a 10 mm outer diameter, 0.6 mm thickness tube. The signal to noise ratio is excellent, in this case the probe frequency is 10 MHz. The advantages of the phased array technology for these applications are mainly in the mechanics, only one axis of axial motion of the tube is required, there's no need for mechanical rotation such like conventional rotating heads, and the initial settings, deflection and focusing of the beams, before the inspection, are more easy and reproducible by electronics. The phased array probes and applications we have described need a powerful multi-channels electronic system to ensure the high acquisition rates. The system we have developed is based on a 16 towards 128 channels multiplexer driven with real time software running on UNIX-RT operating system. Acquisition and data storage rates with the C-Scan acquisition mode (peak amplitude and time of flight of one echo) is up to 27 kHz, which allows about 200 rotation per second beam rotation speed for a 128 elements probe. For full A-Scan (512 points) acquisition mode and storage the rate reaches 3 kHz. Phased array probes and electronic beam synthesis are powerful techniques to solve ultrasonic inspection problems, where mechanical and/or inspection rate are very constraining. The probes and acquisition systems developed by FRAMATOME have now lead to industrial applications for in service or manufacturing tube inspection. Desruelles D., Burat O., Pierre G.